With cut-out on front cover to show one picture without opening the album. Album can accommodate all Maxi series "6000" pages. If its not what you expected, send it back. More policy details on our website. This is it! The NEXT GENERATION top loaders for the ultimate in card protection. -Archival safe, no PVC. This does not apply if you are purchasing our custom glass display cases (see below) . Interior Size: 6" x 4-1/4"H (open on 4-1/4" side). Exterior Size: 6-3/16" x 4-7/16"H (157 x 113mm). Transparent polyester page with crystal clear pockets welded (not glued) onto polyester backplate. Many other pages are also available for the Maxi Album. The craftsman of our German bookbinders and woodworkers show through in every product and is second to none. (Need more or less?. ). Wallet-style pocket album with 20 inbound clear polypropylene pages for holding up to 40 postcards (if stored back-to-back). Each sheet can hold two postcards up to 4 1/8 x 5 3/4 (105 x 148 mm) in size (A6 landscape). Dark-blue padded cover with silver-colored embossing. Perfect to take your postcards on the road. Manufactured by BCW. The PVC used in BCW Toploads contain no plasticizers or stearates. Archival Safe. Made of High Impact Rigid PVC. Your First Stop For Hobby Supplies, Trading Cards and Sealed Boxes. Single Cards - Baseball Single Cards - Basketball Single Cards - Football Single Cards - Hockey Single Cards - Non-Sports Single Cards - Soccer Single Cards - UFC / Wrestling. Our fees, service and organization is top quality. They are constructed of white corrugated paper and have a 200 lb. test strength. 7 x 4 3/4 x 15. 6 1/2 x 4 1/2 x 14. (Anyway, just keep that in mind, :). Manufactured by BCW. Archival Safe. All your storage and protection supplies in one place. Your First Stop For Hobby Supplies, Trading Cards and Sealed Boxes. for any reason. 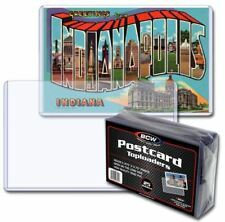 Box 100 Pages BCW Postcard Protective Pages 4 pocket Standard Size 3.5"x5.25"
BCW Protective Pages - One (1) Box of 100 Pages. This product features high-clarity polypropylene and top loading pockets with strong welds. BCW Pro 4-Pocket pages fit all standard 3-ring binders and albums. 25 5X7 TOPLOAD HOLDERS, HIGH QUALITY RIGID PVC. FOR PHOTOS, CARDS, AND MORE. Fits 4x6 Toploaders. 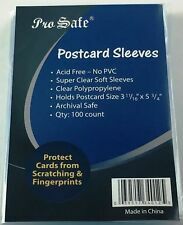 Ultra Pro 4" x 6" Size Soft Sleeves. Manufactured by Ultra Pro. 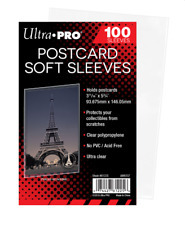 Archival-grade, acid-free and non-PVC premium card sleeves designed to hold standard 4" X 6" cards. Ideal for use with photos, large cards and with matching size toploaders. These are new in the plastic I opened one to be able to take pictures. They are 3 ring plastic binders. Manufactured by BCW. BCW Card Sleeves are an acid free, archival quality product made of crystal clear polypropylene. Acid Free and Archival Safe. We Carry Everything! Crystal Clear Polypropylene. All your storage and protection supplies in one place. Large orders will automatically be upgraded. For item listed in title. Magic the Gathering. Holds any item up to 3 1/2 x 5. Archival safe, no pvc, acid free, uv protection, lays flat, super strong, highest clarity and pre punched for 3 ring binders/albums.